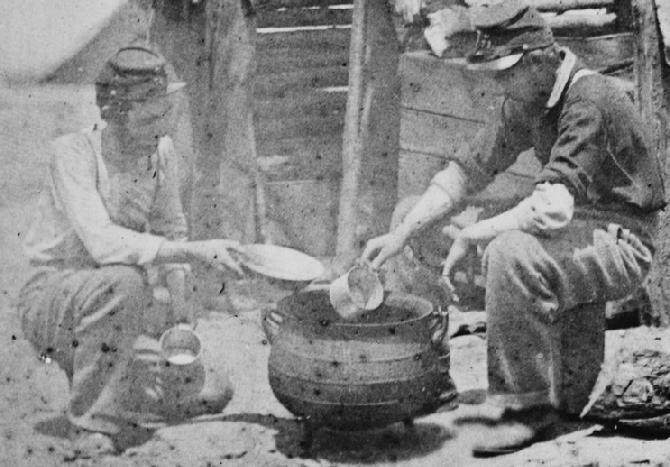 Soldiers of the 71st New York Volunteer Infantry Preparing their meal, [Soup or Stew ?] in a large kettle. Notice the cup one soldier uses as a dipper. It appears to be about 4 inches diameter, but is definitely much shorter than the "standard" cup. Unidentified Soldier posed in a Photographer's Tent or Studio. He has a 3-tine fork in one hand, and butter knife in the other, with an apple on his plate. 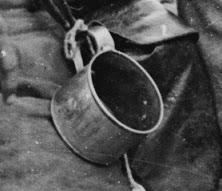 But notice his shorter than "standard" tin cup, resting on top of his knapsack. Here are some of the NCOs of Co. D, 93rd New York Infantry. This picture is chock full of interesting stuff. If you have a chance, download the full image at the LOC and give it a look. But for now, notice the size and types of cups on their table. 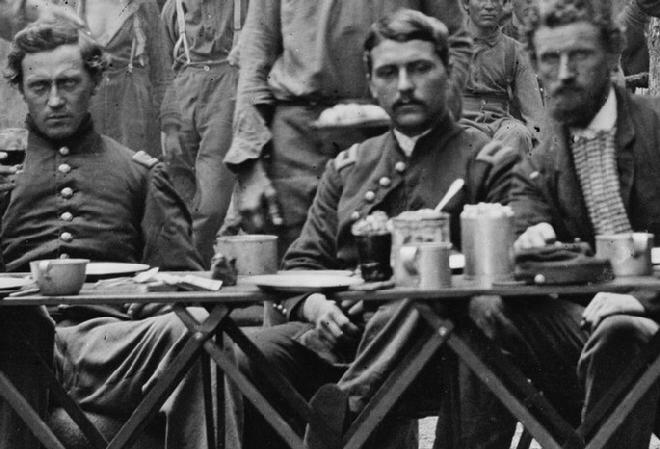 Here are Officers of Co. F, 93rd New York Infantry having dinner at Bealton, Virginia. Again notice the size and shapes of their cups. Another interesting piece of information in this book concerns the short, slightly concial tin cup seen in several of the above photos, that closely resembles some of the coffee cups of today. They illustrate it and mention that it was called a "Mix" cup, so named after the company that manufactured it. 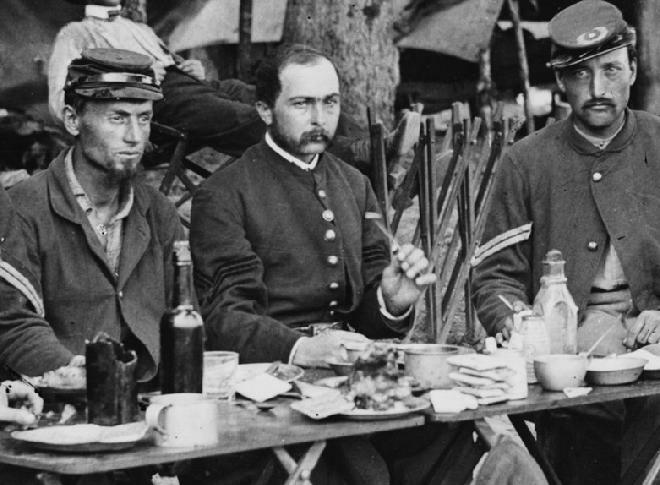 Here is what the U.S. Army Quartermaster Foundation says about Civil War Period soldiers and cooking their rations. From: Feeding Billy Yank: Union Rations between 1861 and 1865, by J. Britt McCarley, Quartermaster Professional Bulletin – December 1988, US Army Quartermaster Foundation, Fort Lee, Virginia. "The real trouble began when Billy Yank received the ration. On a march, it usually consisted of four parts: three-fourths pound of salt pork, one pound of hard bread (hardtack), coffee, and sugar. Few soldiers knew much about cooking, and the Army was still about a half century away from training cooks. 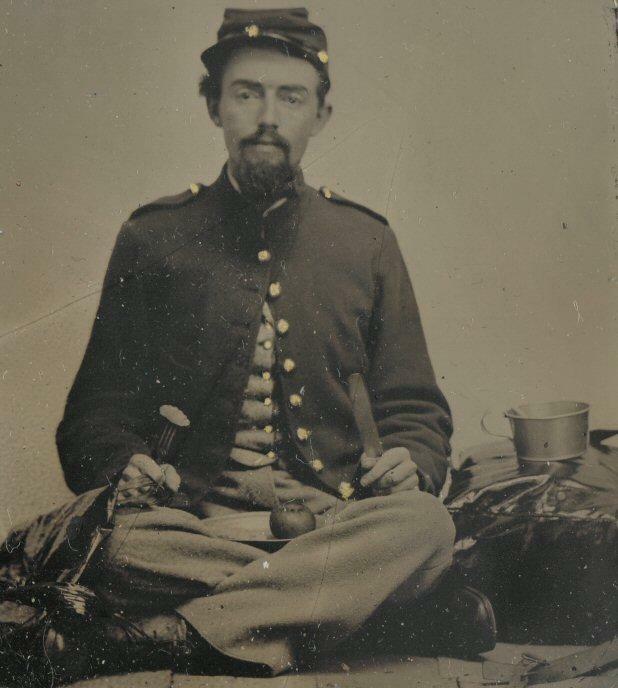 Further, the soldier's issue of equipment did not include any cooking utensils beyond camp kettles and mess pans, for use by the company in camp or in garrison. 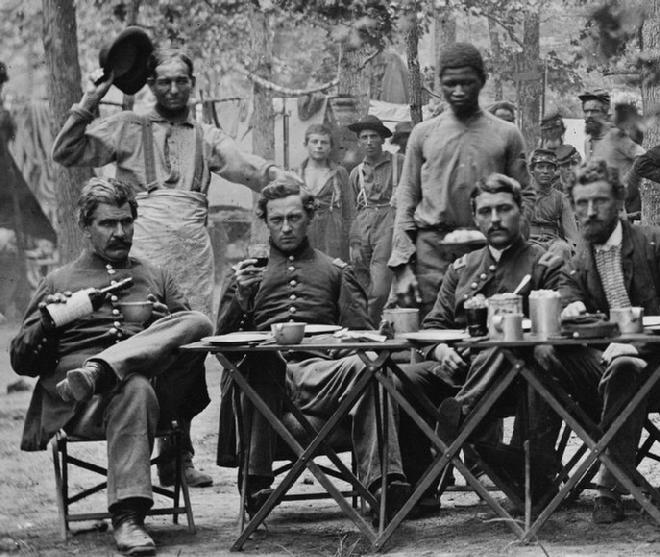 Faced with few tools, little culinary skill, a hunk of pickled pork, and around ten thick and large hard crackers made of flour and water, Federal soldiers began to cook. As time went by, they acquired utensils such as cutlery and a tin plate and cup, fashioned boilers by adding a wire bail to an empty tin can, or rigged a frying pan from discarded canteen halves with a green stick to serve as a handle. They also discovered that by forming a mess of approximately five soldiers, preparing meals became a social occasion." In this iconic photograph of Confederate Prisoners captured near Gettysburg, note the tin cup the man on the left carries. 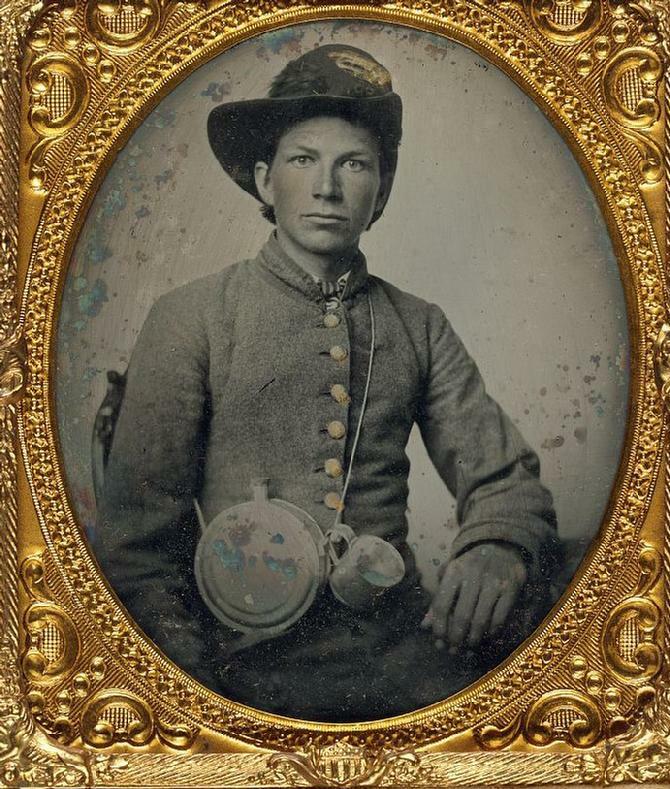 Finally, here are a couple of quotes, about soldiers procuring tin cups at a sutler establishment, and just below this portraits of Billy Yank & Johnny Reb, ready for war, and both carrying tin cups. We got here yesterday about 2 o’clock. We got some rations. They are ? of my regt. They sent off a lot of men to fortress Monroe. They was a building burnt in Baltimore tonight. I bought a tin cup of a sutler here. I gave 20 cents for it. It rained here today. 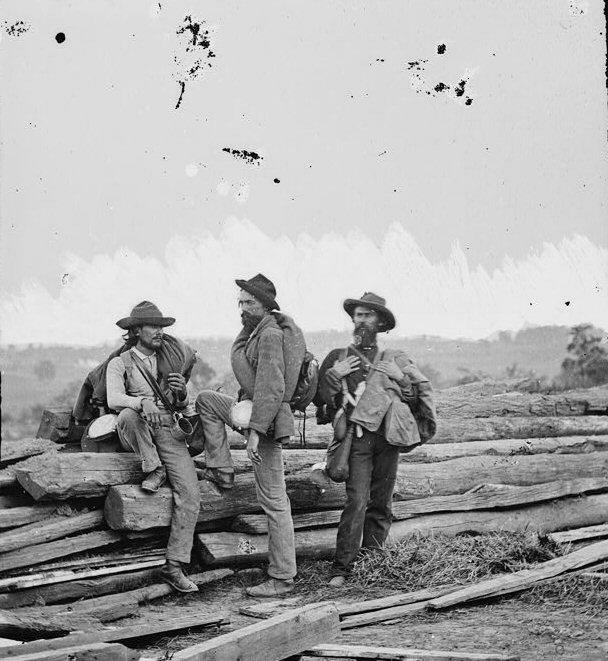 October 29, 1864 – Today I went to the sutler with about sixty-five dollars to buy articles for my division, spending the whole evening outside the fort, on parole, and getting as much as I could eat and drink in the shape of cakes, ale, sherry, etc. My purchases seemed to please the division. The sutler expects a good stock of goods, and it is understood there will be no restriction on purchases. About one-half on the men in my division are purchasers, but most of them on a small scale. Colonel Carmichael is very particular that the sutler shall sell to us at the same rates he does to their regiment, but I feel sure the sutler dodges this order on articles in which he can advance with safety. Today in buying a tin cup from a J-- of a clerk, the price asked was twenty cents. A private in the One Hundred and Fifty-seventh, standing by, told the clerk he was charging me more than he was allowed. Some rough words passed and the private whipped the clerk in fine style. Of course, we didn’t interfere, but the sutler insisted on twenty cents for the cup, though the private says fifteen cents is the price. It is the first time I have seen a Yank fight for Rebel rights. 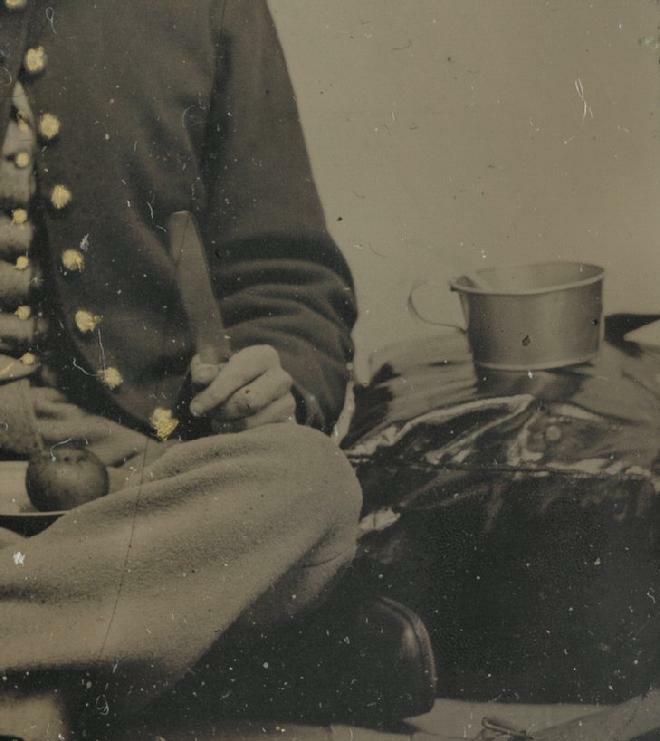 Unidentified Confederate with Canteen & Tin Cup. 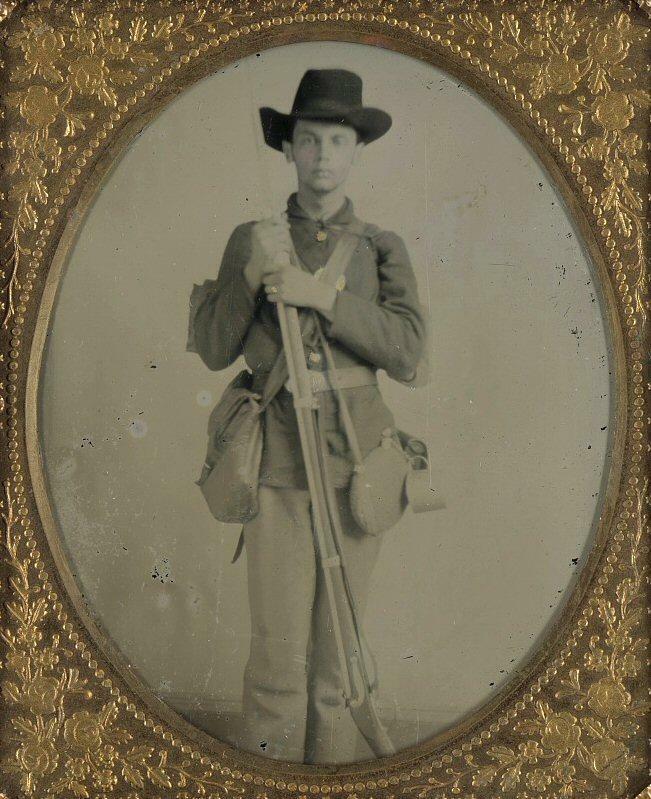 Unidentified Yankee with rifle, rig, and tin cup.